Original Vitalzym is no longer available. Vitalzym now comes in a liquid gelcap that has been reformulated for greater absorbency and reduced dosage. We Are Selling Vitalzym At the Lowest Price Allowed On the Internet! Vitalzym systemic enzymes give your body what it needs to function optimally. Vitalzym contains protease, serrapeptase, papain, bromelain, amylase, lipase, rutin and amla. Without enzymes, human life could not exist. Every process in the body requires enzymes and we humans only store a finite amount in our bodies. 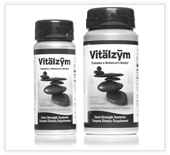 A blend of systemic enzymes, Vitalzym replaces the precious enzymes your body uses up during the process of living. Enzymes are the body's first line of defense against inflammation. 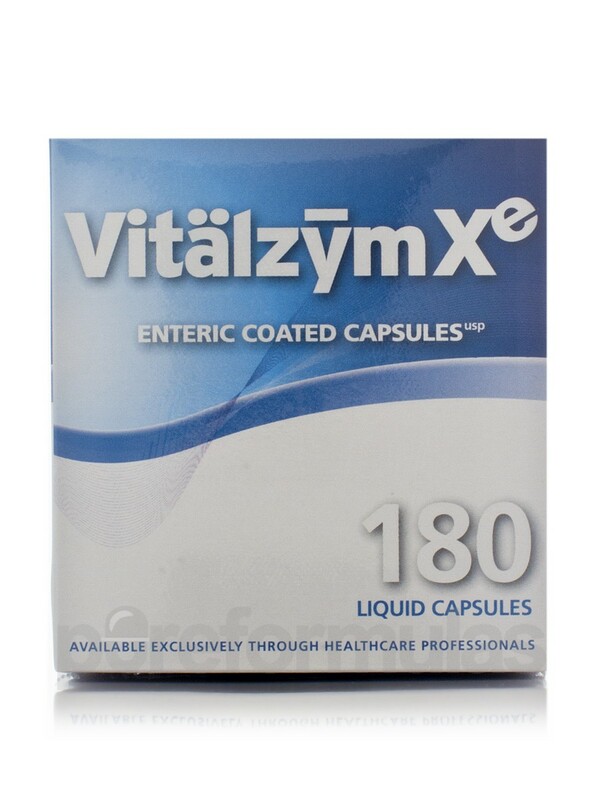 Vitalzym are proteolytic (protein eating), systemic (system wide) enzyme supplements. They can prevent inflammation flare-ups and are your ally in the healing process if irritation has already taken hold. Your body is your home in the truest sense of the word. But when you find yourself surrounded with inflammation, pain and disease, you can’t just up and leave. Anti-inflammatory drugs, both prescription and non-prescription, have serious side effects. Each year, 20,000 Americans die from non-steroidal anti-inflammatories (NSAID’s). Another 100,000 are hospitalized with liver damage, kidney damage or bleeding intestines. Steroidal anti-inflammatories including Prednisone may provide temporary, symptomatic relief from swelling, inflammation and pain, But the cost is high, a compromised immune system, and possible heart and liver damage. Dr. Max Wolf, M.D., who researched enzymes and hormones at Columbia University from the 1930's through the 1960's, determined that enzyme production diminishes in humans after age 27. To add insult to injury, you deplete your enzyme stores every time you eat food cooked at temperatures over 118 degrees Fahrenheit. Raw food contains its own enzymes that are used in the digestion process. Cooking destroys them. So if you are over 27 and eat cooked foods, you either have an enzyme deficiency or on your way to one. The best way to avoid the onslaught of problems associated with enzyme deficiency is to supplement with systemic enzymes. These enzymes are also referred to as proteolytic (protein eating) or fibrinolytic (fibrin eating) enzymes. Fibrin is a protein mesh that forms the framework for new tissues during wound healing and scar tissue formation. Just like the oatmeal in Goldilocks and the Three Bears, the amount of fibrin has to be just right. Enzymes gobble up excess fibrin that leads to excessive scar tissue after surgery or an injury. Too much scar tissue can cause pain, restricted range of motion and conditions including fibrocystic breasts, uterine fibroids and shrinkage of organs. An overabundance of fibrin in the bloodstream causes the blood to thicken, and clots and plaque to form. Researchers discovered serrapeptase, one of the key ingredients in Vitalzym, when they found that silkworms use it to dissolve their chrysalis, the hard shell that protects them during the stage between larvae and moth. In humans, serrapeptase digests non-living tissues, blood clots, cysts, arterial plaque and all forms of inflammation. It gobbles up the proteins you do NOT want hanging around, including the ones that cause scar tissue and fibrosis. Serrapeptase is a workable alternative to aspirin, ibuprofen, acetaminophen and other non-steroidal anti-inflammatories (NSAIDs). These over the counter drugs are toxic to the liver. Other NSAIDs including Celebrex and Vioxx can cause heart failure, kidney failure, ulcers and death. Neither NSAIDS nor steroidal anti-inflammatories attack scar tissue. All the ingredients in Vitalzym work synergistically to extinguish inflammation. proteolytic enzyme from the papaya plant. It treats swelling and scar tissue both in your vocal cords and throughout your body. It speeds the healing process and diminishes swelling after surgery. Papain promotes healing of injuries and and bruises. It speeds up wound healing, and is used to treat ulcers. Papain is also used for defibrinating wounds in hospitals, preventing cornea scar deformation, treating jellyfish and insect stings. It is helpful for indigestion, dissolving membranes in diphtheria, and to reduce fever, swelling and adhesions after surgery. .
proteolytic enzyme derived from pineapples. Bromelain reduces inflammation and swelling in your throat and body. It is a natural anti-inflammatory that decreases the swelling that causes the joint pain of arthritis. It may also reduce the symptoms and dysfunction of carpal tunnel syndrome. Bromelain promotes healthy blood flow by decreasing platelet stickiness. group of enzymes that break down sugars and starches. It is an anti-inflammatory that helps to modulate reactions caused by the release of histamines and similar substances. bioflavonoid found in citrus fruits, rose hips and other plants. Rutin has been creating quite a buzz lately. It is considered to have anti-inflammatory, anti-oxidant, and possible anti-cancer properties. It helps to maintain and strengthen blood vessels, which helps people who bleed and bruise easily. It helps the body utilize vitamin C and maintain collagen. Collagen keeps your skin elastic and firm. Wrinkles are associated with the breakdown of collagen. It is a good source of amino acids and minerals (zinc, copper and chromium). Studies have found amla boosts the immune system and is helpful in diabetes and respiratory problems. You can’t perform up to your potential if you don’t feel well. Your overall health has an enormous impact on your relationships, your career and longevity. All the ingredients in Vitalzym benefit your health. Why take a chance with dangerous drugs? WARNING: DO NOT take this product without the consent of your physician if you are currently taking anti-coagulants (blood thinners). DO NOT USE if you have a bleeding disorder. Discontinue two weeks prior to surgery. If you are pregnant, consult with your doctor before using. Manufactured by World Nutrition, Inc.
All material on this website is for informational purposes only. Nothing contained on this website is intended to be used as medical diagnosis or treatment. It should not be used in place of the advice of your physician or qualified health care provider. Before starting a new treatment, diet or fitness program, consult your physician, or other licensed health-care professional. You should not use this information for self-diagnosis or for treating a health problem or disease. Contact your health-care provider immediately if you suspect that you have a medical problem. Information and statements on this website regarding dietary supplements have not been evaluated by the Food and Drug Administration, and are not intended to diagnose, treat, cure, or prevent any disease or health condition.